Crazy Random Thoughts & Recipes – just between friends! It’s almost November and still in the 90’s out here in AZ! I’m way past ready for cooler weather and comfort food. I’m afraid we might just be swimming on Thanksgiving Day!! 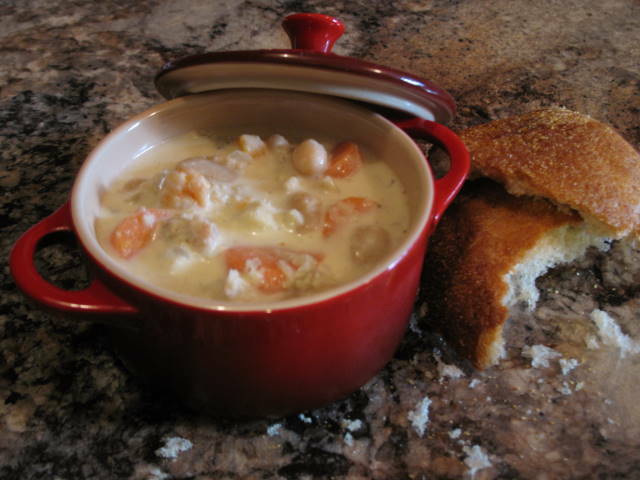 I felt it was time to take things into my own hands… I came home from work and cranked the air down to freezing… when I started to get a chill, I put on a sweater and started some chowder! It’s a pretty simple thing, just a little of this and a little of that… simmer and drink in the lovely aroma. I tore off a nice piece of bread and had dinner!! Place clam juice and garlic in a large pot over low heat. Cook and stir until simmer is reached. Mix in green onions, carrots, corn, potatoes, parsley, and remaining cream. Season with black pepper and bay seasoning. Simmer 25 minutes. Do not boil. Cut bacon into 1” pieces and fry until almost crisp (if a thicker soup is desired, add flour to bacon drippings and stir) add bacon and drippings to pot. Add the shrimp, scallops, crabmeat, and clams to pot and continue cooking 10 minutes, or until seafood is opaque. If more volume is desired, add chicken stock & milk in equal amounts. Always use fresh ingredients whenever you can! If fresh is not available, frozen is the next best thing. I suggest canned goods only be used as a last resort – the taste is inferior and sodium content is high. Be a Fat Bottomed Friend! Want to be a fat bottomed friend?? Just enter your email address to subscribe to this blog and you will receive notifications of new posts by email. Make me a Fat Bottomed Friend! !